Drie and I headed out to Lansing for Scott Kelby's Worldwide Photowalk, our first organized Photowalk. 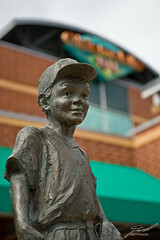 We met at Oldsmobile Park about 5:00PM where we started shooting. This will be the last season for Oldsmobile Park as it's getting a next change next year. The thing that struck me about the stadium though was the statues around the front. I found this one especially interesting with the stadium sign in the background.